Vidushi has ever been a craft lover. She loves perceiving beauty even in mundane life. To pursue her hobby as career, she joined NIFT, where she was introduced to grandeur of traditional Indian crafts. This inspired her to explore endless possibilities of re-innovating Indian heritage textiles. With sensitivity towards hand made products, an eye for art, attention to details and creativity, she passionately worked with reputed export houses, artisans and art curators to research on a few of India’s dying crafts and aspired their revival for modern generations of artisans and consumers. Upon years of dedicated hard work, Vidushi is seeing success in meeting her goal of integrating intricately worked traditional textile techniques like Crochet, Mochi embroidery, Bandhani, Sanganeri prints, Kantha work and Barmeri applique;  with contemporary fashion trends, creating out of the box, bohemian yet useful handicraft goods. 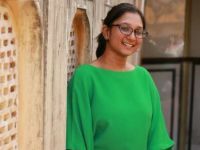 Having won positive reception overseas, she aims to make these, fine quality unconventional and nature-friendly merchandise available for the Indian market through her label; Kalaaai. We ship internationally using best in market courier services within 7 - 12 working days from the date of order confirmation. Please fill in correct details of your shipping address and pin-code to help us serve you better. We are known for our quality tested products. In case of any issues reach us within 30 hours of delivery and we'll put our best foot forward to address your concerns.